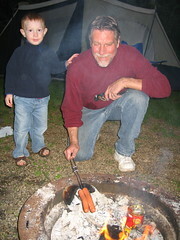 On Friday, Kade and I went, with my dad, on a Father and Son Campout. Our church does this annually and this is the first one that we all three have attended and Kade's first camping experience. It was held at The Res in Mishawaka, IN. Kade and I got there a little after 6:30 pm, grabbed our gear, and headed down the trail towards the camp site. 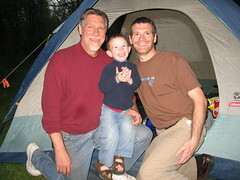 We then helped my Dad setup the tent. 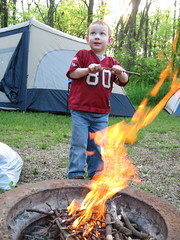 Next it was time to build a campfire. 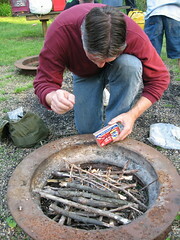 We all helped build the log cabin of twigs and with the help of some dryer lint and one match, we had a great looking fire. After a quick trip to pickup some breakfast supplies, we took a three generation picture and then it was time for some dinner. We had hot dogs and dad and I topped them off with some chili and cheese. Towards the end of dinner we had a few small sprinkles of rain but nothing too bad. The night came to an end with a spiritual message about the commemoration of the Aaronic Priesthood, which is the basis for the Father and Son Campout. 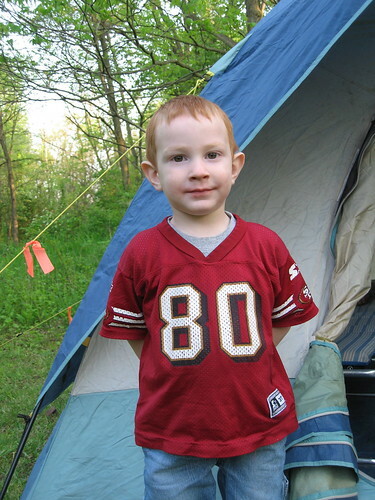 It was getting quite late so we headed off to our tent while others stood round the campfire telling stories and jokes.Kade slept through the night in his new Lightning McQueen sleeping bag while I on the other hand didn't get much sleep at all. It rained on and off through the night, but we stayed warm and dry inside the tent. Unfortunately we had to leave a little after 6:30 am to get home in time for Megan''s softball game so we missed out on breakfast.We had a really good time together and oh yes, this story would be incomplete if I didn't tell you about Kade's favorite part. He got to pee in the woods and thought this was the funniest thing. I guess the camp site did have a restroom but that was too far away and they always smell really bad, so Kade helped water nature. 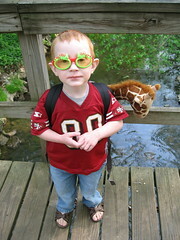 So cute-especially Kade's sunglasses, and the three generation picture. I love those guys! Looks like Grandpa might have a buddy for some campouts! 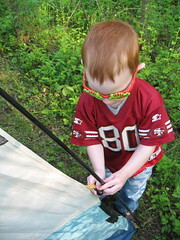 Kade looks so proud to be one of the "big guys" doing some camping. We miss the SB ward campout. I don't think we're going to the one in our ward here. Everyone's kinda into guns and rifles and such, and we're not big on hanging around deacons with firearms. Every time we talk about camping Logan mentions your tent getting eaten by a raccoon. Anything exciting like that happen? Wow, those dogs look delicious! !